UV emulsion by friendly minerals and plants to your skin : Happy Aging & Beautiful Anti Aging loving. The more warm prefer the outside today , on a par with the end of April , spring in full bloom. The cosmetic , will enter the season when ultraviolet rays of care comes in the mood. 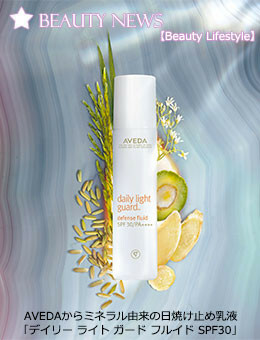 Friendly sunscreen to your skin New release from AVEDA. Firmly guard the skin from ultraviolet rays in the mineral component. Also it will protect your skin from further environmental stress by the force of the plant.